Brought back into print in the 1990s to wide acclaim, re-designed new editions of Robert van Gulik's Judge Dee Mysteries are now available. Written by a Dutch diplomat and scholar during the 1950s and 1960s, these lively and historically accurate mysteries have entertained a devoted following for decades. Set during the T'ang dynasty, they feature Judge Dee, a brilliant and cultured Confucian magistrate disdainful of personal luxury and corruption, who cleverly selects allies to help him navigate the royal courts, politics, and ethnic tensions in imperial China. 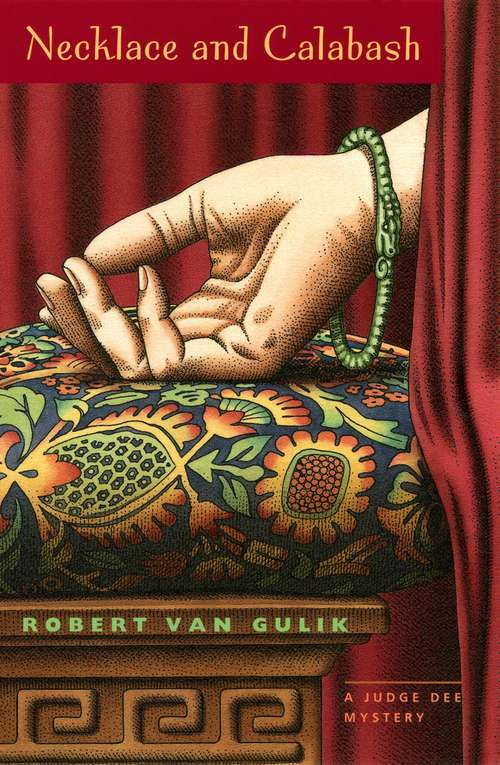 Robert van Gulik modeled Judge Dee on a magistrate of that name who lived in the seventh century, and he drew on stories and literary conventions of Chinese mystery writing dating back to the Sung dynasty to construct his ingenious plots. Necklace and Calabash finds Judge Dee returning to his district of Poo-yang, where the peaceful town of Riverton promises a few days' fishing and relaxation. Yet a chance meeting with a Taoist recluse, a gruesome body fished out of the river, strange guests at the Kingfisher Inn, and a princess in distress thrust the judge into one of the most intricate and baffling mysteries of his career. An expert on the art and erotica as well as the literature, religion, and politics of China, van Gulik also provides charming illustrations to accompany his engaging and entertaining mysteries.